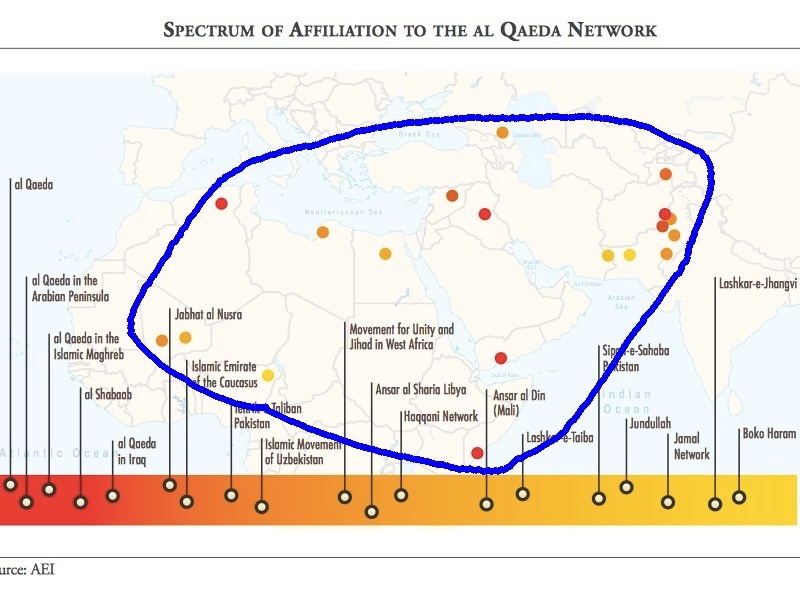 In The Al Qaeda Network: A New Framework For DefiningThe Enemy, Katherine Zimmerman of the American Enterprise Institute describes the terrorist groups affiliated with Al Qaeda. Zimmerman is seen as a leading expert on the Al Qaeda network, having testified about it to Congress and written about it for The Washington Post, the Weekly Standard, and the Huffington Post. However, the known distribution of the world’s population of Muslims does not support that contention. According to the Pew Research Center, only about 55% of the world’s Muslims live inside the Al Qaeda network region. The other possibility is that, since the area is rich in untapped resources, powerful people have used claims of terrorism as a pretext to invade. That possibility is definitely supported by evidence. For example, ten years after the U.S. invasion of Iraq, U.S. officials began openly admitting that the war in Iraq was motivated by the desire to seize oil. U.S. military leaders including General John Abizaid, head of the U.S. military in Iraq, and Defense Secretary Chuck Hagel have said that the war was about oil. Even former Federal Reserve Bank Chairman Alan Greenspan admitted it. Geographical correlation also supports this possibility much better. When the region outlined by Zimmerman’s Al Qaeda network is superimposed on a map of oil reserves by country, over 70% of the world’s oil reserves fall within the same area. If one considers only oil reserves that are not yet fully within the control of the world’s superpowers (the U.S., Russia, China, and the E.U. ), about 90% of what is left is within Zimmerman’s region. Only Venezuela, with 6.5% of the remaining oil, stands out. It is therefore not surprising that the U.S. government has recently declared Venezuela to be a national security threat. The strong correlation between Al Qaeda and oil suggests that the terrorist group might be better named Oil Qaeda. However, the truth is a little more complex. As reported before, the geopolitical significance of this relatively small part of the world is as much about natural gas as it is about oil. Other critical resources, including lithium and gold, are motivators for those wanting control of the region. There’s no doubt that the Al Qaeda network serves multiple purposes. For those who want simple answers, there will continue to be propaganda about the region’s problems with “Islamic terrorism.” For those who can still think and see, it’s becoming increasingly clear that Al Qaeda and its associated network is largely an excuse for seizing resources.